Low Mileage, Power Windows, Power Doors, Cd Player! 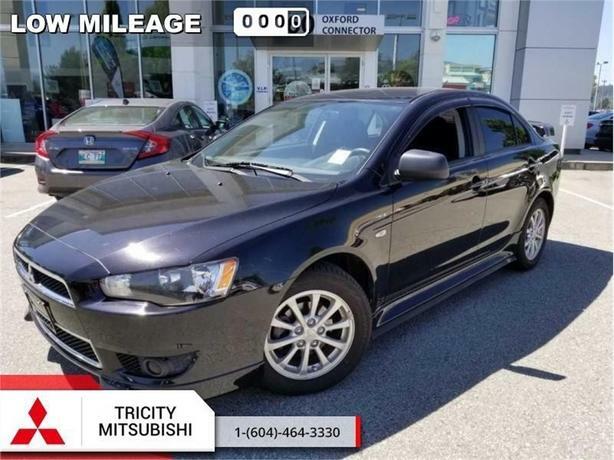 Check out the large selection of pre-owned vehicles at Tricity Mitsubishi today! For a practical economy sedan with a sporty attitude, check out this Mitsubishi Lancer. This 2013 Mitsubishi Lancer is for sale today in Port Coquitlam. This Mitsubishi Lancer builds on a proud history of outperforming drivers' expectations while quickening their pulses. Its rigid body construction and sport-tuned suspension deliver the safety and excitement you're looking for. This Lancer features a striking exterior design complemented by a sporty front grille, bold body lines, and a commanding aerodynamic stance. This Mitsubishi Lancer delivers an invigorating driving experience, designed to outperform. This low mileage sedan has just 54094 kms. It's nice in colour and is major accident free based on the CarProof Report. It has a 5 speed manual transmission and is powered by a 148HP 2.0L 4 Cylinder Engine. This vehicle also has the following features: Power Windows, Power Doors, Cd Player. It has some remaining factory warranty for added peace of mind. Our Lancer's trim level is DE. The DE trim makes this Lancer an outstanding value. It comes standard with an AM/FM CD/MP3 player, a multi-information display, power windows, power doors, auto-off halogen headlights, a tilt steering column, intermittent windshield wipers, a tire pressure monitoring system, active stability control, traction control, and more.